It’s the summer of 2015 and I’ve been eyeing up the CB500X since they came out a couple of years back. Now I’ve finally succumbed to my own common sense, getting what looks like a brilliant deal on a year-old ABS with just 1500 miles. This is the bike I’ve been edging towards via XCountrys, TDMs and Versii. 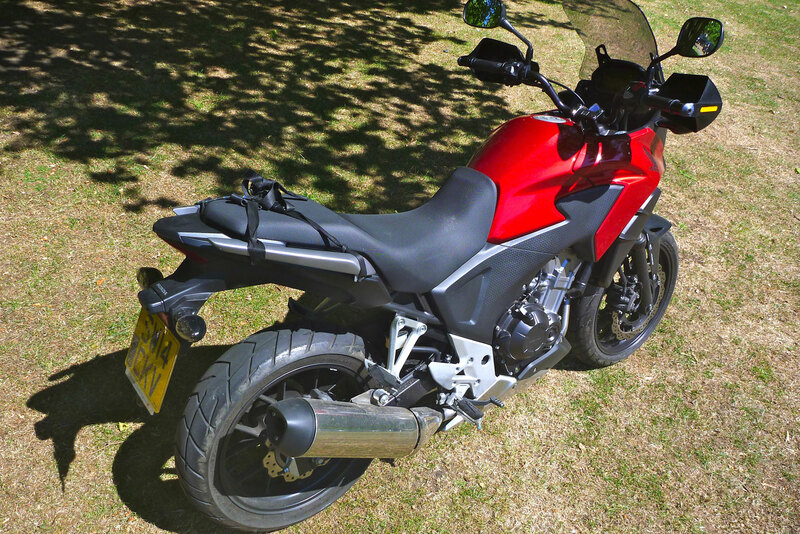 Suddenly the idea of skipping my next planned bike – probably a clapped-out DRZ with 10,000 miles and five previous owners – felt rather attractive. They stopped selling DRZs in the UK in 2007 so the low hanging fruit is long plucked. This CB-X has the potential to be a proper execution of the half-baked GS500R I made a few years ago, especially since Rally Raid Products started developing their CB500X wheel / suspension / protection kits which are now for sale to make it into a mini new Africa Twin. 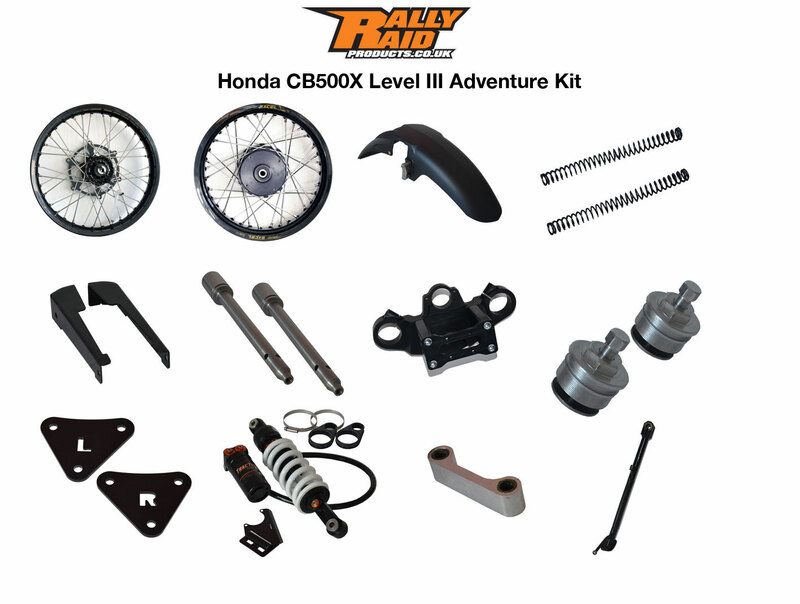 The RRP CB-X Adv kit comes in three levels and doesn’t appear to be just another ‘hard parts hand-job’. They’ve produced the minimal amount of essential adaptions and modifications to make the ‘nearly there’ CB-X into a functional gravel bike, and it’s all easily fitted by the buyer (or I’ll find out soon if not). 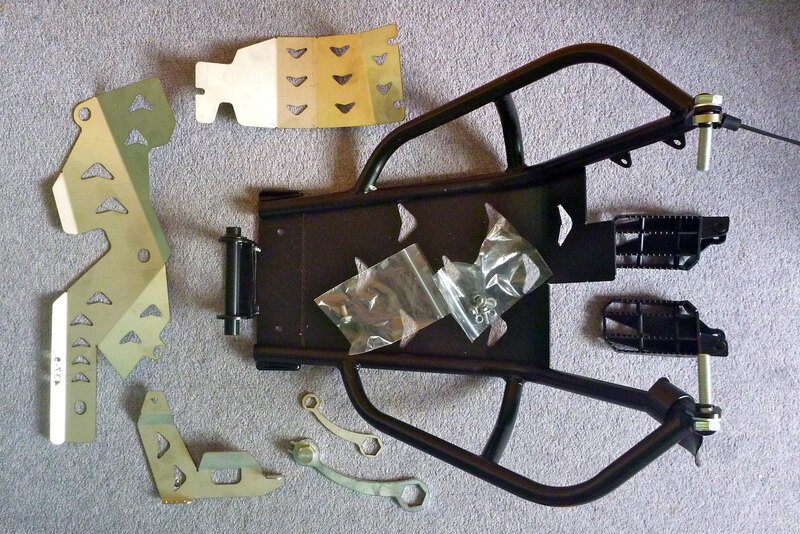 The Level III kit (left) includes: front 19″ Excel; front suspension lengthened and reworked with a custom milled top triple clamp; Tractive shock plus modified linkage and side plates. Rear Excel in 17 plus a longer side stand to deal with the 2-inch height gain (equipped bike, right). Other accessories include racks, pegs, levers and special wheel wrenches. 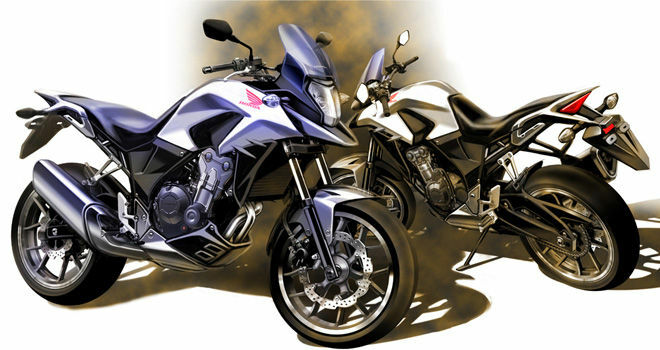 AFAIK this potential to develop the CB-X into a do-it-all travel bike was spotted by former Dakar-racer Jenny Morgan. 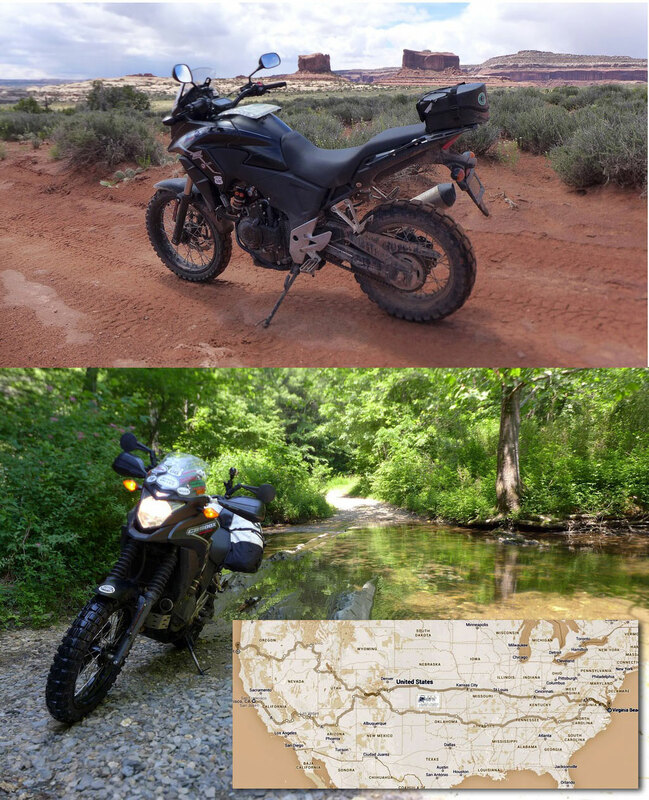 Perhaps inspired by the Thai racing Hondas (right), she recently completed a seven-week, 12,000-mile double Trans Am Trail (San Francisco > Virginia Beach > Oregon; left) on a CB500X RRP. 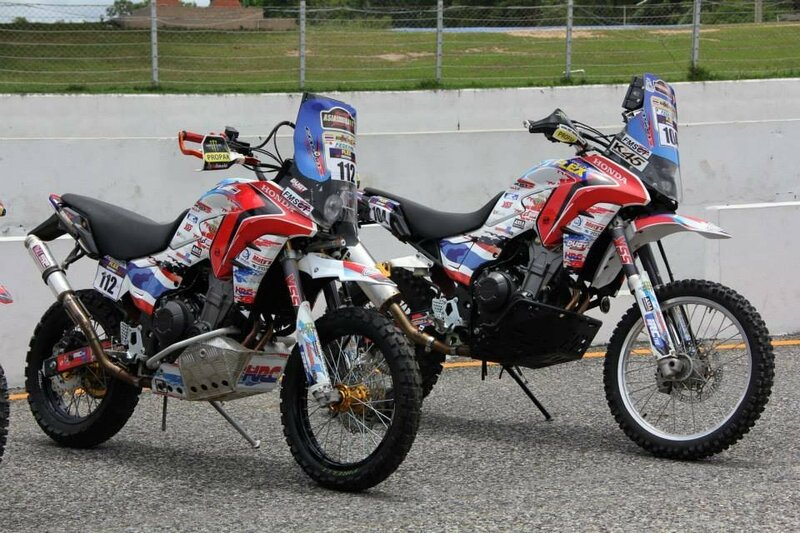 And soon after Rally Raid director John M was down in Ozzie on another CB-X fitted with an identical kit. 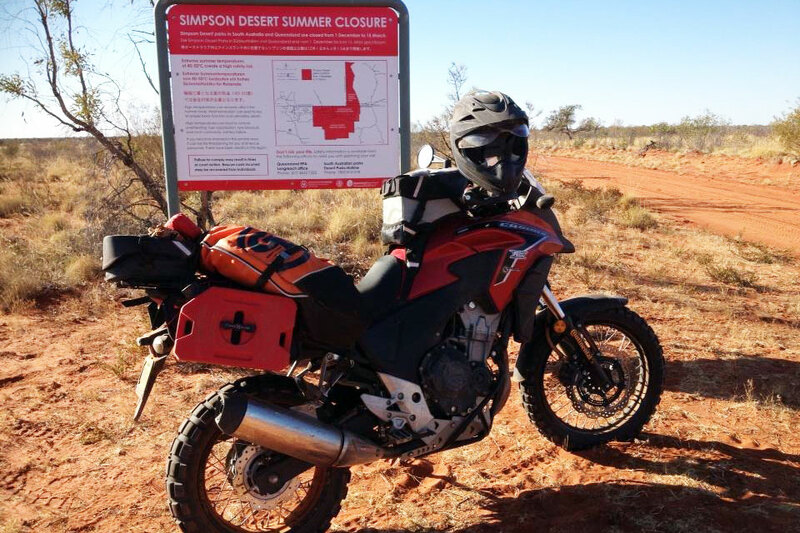 His mission: a big loop of the northern Simpson Desert via the Hay River Track (right) with a bunch of mates on KTMs. I’ve bet him a slab of VB one of the KTMers will buy that bike off him before the ride’s over. The problem is, he probably agrees with me so it’s not really a bet. Me? I only have plans to use my CB-X for my Morocco tours this November and afterwards perhaps take a spin out into Western Sahara, just like in the good old days. I like to think that once I have the Level III RRP kit on the Honda it’ll come close to that elusive nirvana of travel bikes: a ‘getting there’ road runner and a ‘being there’ trail bike. Time will tell, but the CB-X is a chip off an old block which I’ve been whittling away at since the mid-1980s: start with a low-stressed and smooth parallel twin that needs nothing doing to it other than protection. Then add suspension and serve piping hot. The big difference is this time I’ll have a properly engineered machine, not some goofy Scrapheap-Challenge protest bike. The CB has the sort of bland, sewing-machine motor we’d have scoffed at in my youth, but as soon as I sat on it it felt right: light and low (plenty of room for 2 inches of extra RRP springing) and effortless. I wasn’t that impressed when I test rode one earlier in the year, but that’s because I made the mistake of trying an MT-07 right after. 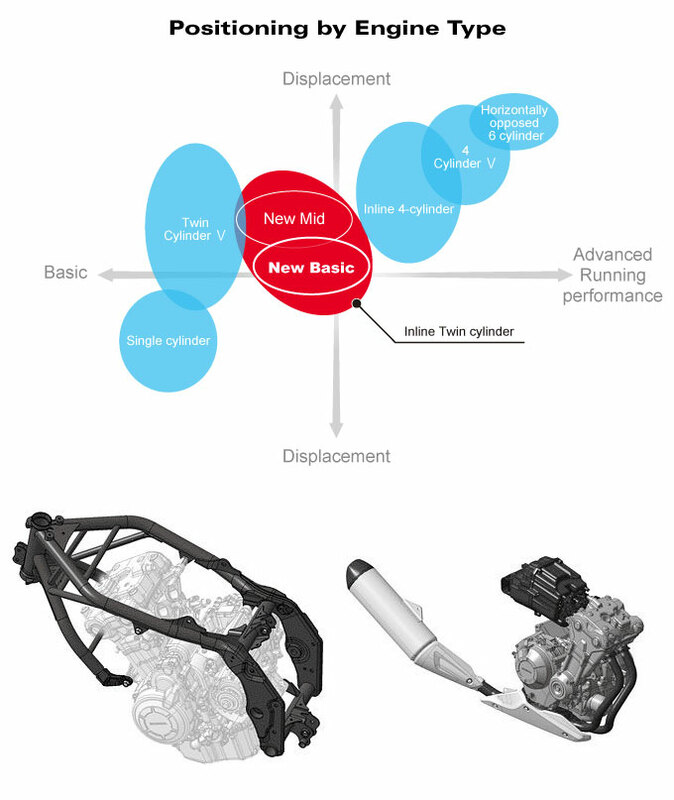 The keyword, or key phrase, for the CB500X is “Feel The Adventure Form.” We propose a new crossover design for active riders who seek the “unexpected” in their lifestyle. The design objective was to give an easily understandable, fresh expression to the key phrase “Feel the adventure form.” In order to achieve this, the following concrete design elements were chosen: WILD, TOUGH and UNBREAKABLE. 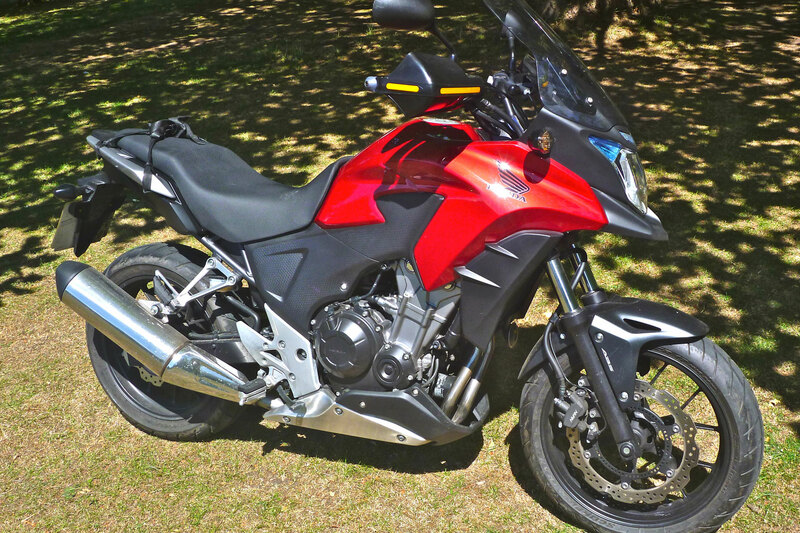 Now I’m a convert to Feeling the Adventure Form as the MT is just going to be a Versys-like Tracer rather than the 700-cc Tenere I hoped. The Honda’s clutch, gearbox and steering are all light as you like, very much like that Mash 400 I rode a few weeks back. Except of course the twin will speed up to 60 and sit on a true 70 easily. Doing speeds like that and a lot of country laning, my first fill up after 133 miles was over in a couple of seconds. 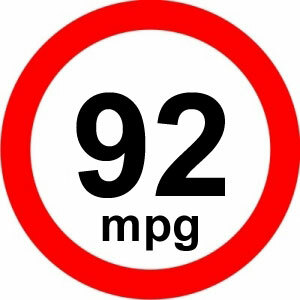 Reason being it used less than 6.7 litres which added up to an incredible 92 mpg (that’s 76 American or 32.5kpl). That’ll do even more nicely and – without going out to my way to save fuel – is the most economical bike I’ve every owned. All the other stuff like going, stopping, turning and cornering are fine, only the soft front and soft back ends kick back at cracks and holes in the road. It’s the expected ‘keeping-the-tyre-from-rubbing-the-mudguard’ quality of suspension we expect on budget bikes these days – and one of the main things the RRP kit addresses. I also did my thing with the bathroom scales: tank topped up it weighs 197kg. 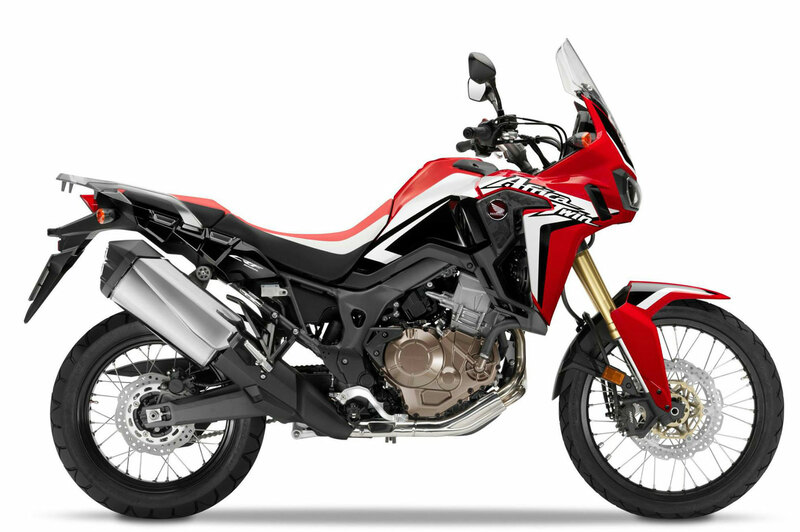 That’s about 25kg less than the Versys which felt much [top] heavier – or some 30 kilos less than the newly announced CRF1000L (right) which seems to maintain the modest power-to-cc ratio of the CB-X (good for the Africa Twin for not joining that race). The CB-X’s weight feels more like last year’s X-Country which was 163kg fully wet. But that bike’s OE tank was half the size of the Honda and I never got close to 92mpg on the BM (80.5 best – conversion chart for other formats). I just bought myself some RRP wheel wrenches which the OE tool kit skips, as well as the chunky RRP crash bar/bash plate which isn’t part of the kits but which is of course a no-brainer. And John put me off trying some pivot pegs and instead kindly threw in a set of his wide platform pegs to try before he flew off to meet the Simpson. More in the coming weeks and months. See the index top of the page. 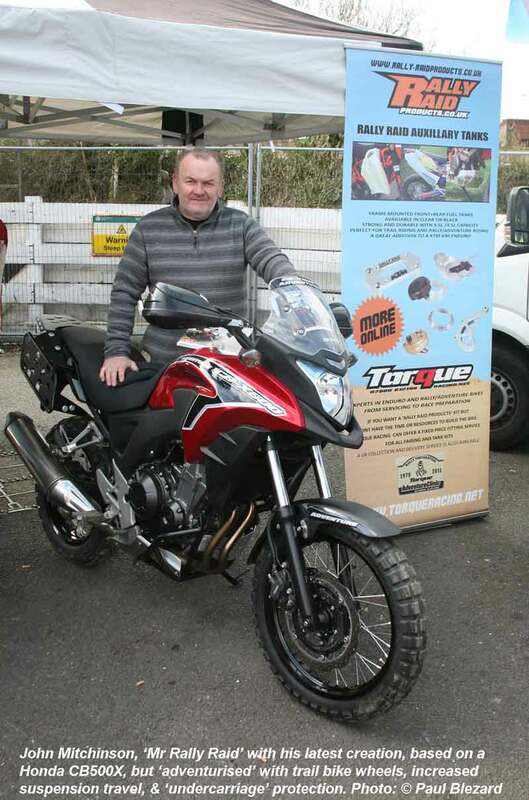 Hi Joe, I never tried a Tracer, but as you may have read I had a quick spin on an MT07 which was enough to convince me that the engine was much nicer. Try them both if you can – I think you’ll find the Tracer will win you over. Half as much power again, same weight wet (196kg), but possibly less fuel efficient and won’t be going as cheap used as older CB-Xs. I reckon a Tracer will be a fitting modern substitute for your old TDM. Keith, go +1 larger on the front sprocket, WeMoto sell them for about 17 quid, best mod u can do and makes the gearing spot on and drops top gear cruising revs approx 400rpm. Engine crash bars(givi) fitted with their Givi S310 auxiliary lights(picked mine up for £63 on Amazon) make a massive difference in lighting at night and I run mine during day to be seen better a là BMW riders. Tire swap to Michelin Pilot Road 4 is highly recommended. I fitted KTM 1190 handguards(heavy duty for own) which I modified to fit, then fabricated a custom stainless steel bracket taken off the mirror stem mount to give them rigidity, much better than Honda’s £100 offering. The usual mainstand, heated grips etc are worthwhile. 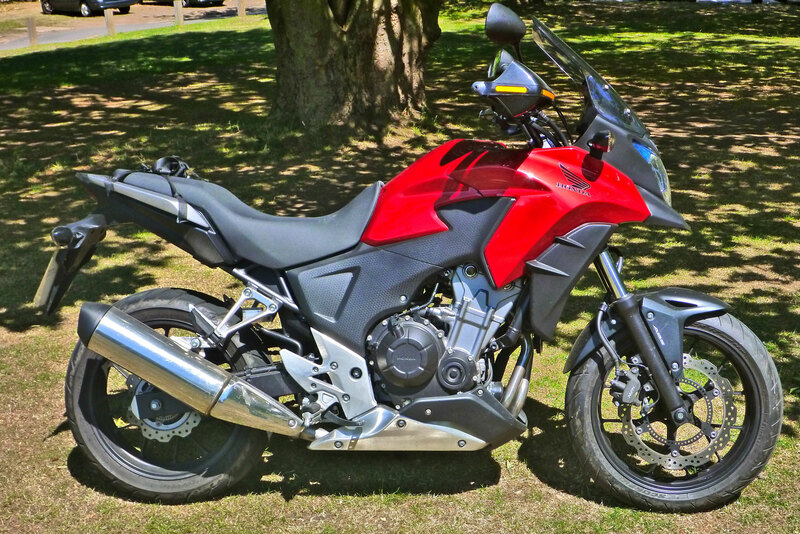 It’s all on the CB500X forum, worth taking a look. Actually very insightful article as I plan to ride from Scotland to Thailand and everywhere in between. 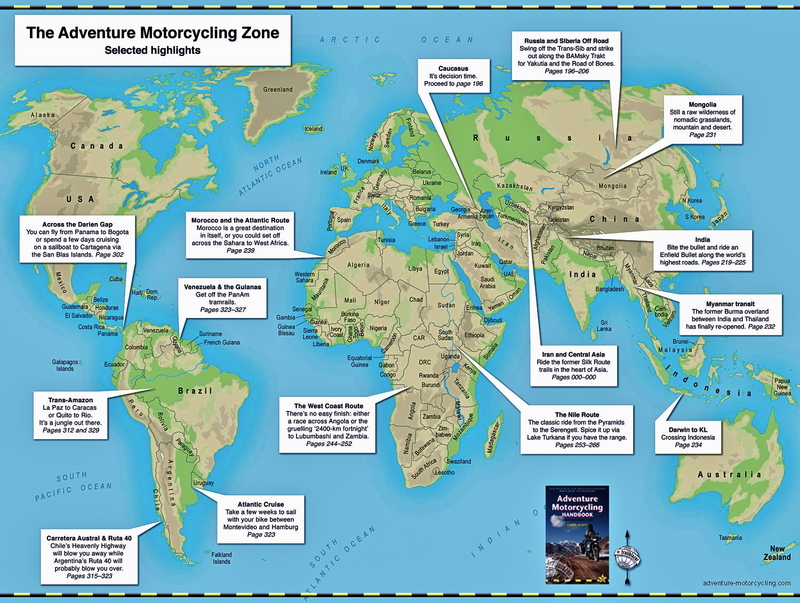 My round the world trip will be on the 500x, I’ll be looking into some upgrades/Customising which will make the journey more comfortable and fun. Feel free to email all advice for my RTW trip about the 500x and any customisations you feel are worth looking into. yes, looks the business Chris. Looking forwards to the finished item.